More than most games, poker has earned itself one serious reputation. For most, it’s a gambling game rooted in smoky saloons and backdoor bars, glamorized by the dazzling city lights of Vegas. Smart suited Mafia-types, cigars, Champagne and whisky and exotic women. Piles of cash. An overall impression of glitz and glam with a racy feel, which mistakenly includes diva-like outbursts and provocative behaviour. Winners showcasing their victories and gloating at the defeated. All great ingredients for a Hollywood movie, but serve only as examples of what not to do. If you’re just learning how to play poker, learning the unwritten rules should help prevent you falling into bad habits. It’s never a good feeling when you don’t understand the lingo, if what’s being said is good or bad. If you should be worried or offended. Following the correct and desired etiquette is fundamental, will help you stay in flavour, plus help you identify bad behaviour in other players and prevent you repeating any dramatics you may have witnessed. – You know you’ve got the winning hand at showdown, but you string it out for all it’s worth, taking your time to turn over your cards, one by one, for full effect. It only winds people up and slows the game down. – You take your time calling an all-in bet, again knowing you’ve got a killer hand. – You slowroll purely to annoy other players, deliberately behaving badly. Winning a hand without going to showdown gives you the opportunity to show your cards. But you must show everyone, not just a select few or the person closest to you. While it may not be technically possible to break the ‘show one, show all’ rule playing online, using the chat box to divulge information is just as bad, probably worse. In the movies and often dramatised in living rooms on Friday nights, when a player makes a string bet is when they place down a chip one at a time, waiting a moment or two in between, either in an attempt to raise suspense or (the main reason it’s a problem) to see how the other players react as they up the stakes, fearful or nonchalant. Do this and you could be in breach of the rules. Just learning how to play poker? Don’t angle shoot! Angle shooting includes a whole set of undesirable acts. Typically, these include things like ambiguous behaviour, deliberately misleading opponents through misinformation. This isn’t the same as wearing a poker face or playing a bluff, but you know when you’re doing something wrong, right? Following unwritten rules while remembering the official ones isn’t always easy. Following these tips will help guide you through and improve your overall experience, plus give you a great reputation. Sounds obvious, but in the comfort of your den it’s easy to get distracted. You don’t want to be accused of slowrolling. Using the chat box to divulge details about your folded hand before play is finished is super-bad. If you’re not involved in their game, don’t chat about how another player is doing. It’s bad form and can have serious implications. Blaming everyone for a bad hand and being a diva isn’t cool. Insulting the dealer and other players won’t help, either. When you win, don’t show off. When you lose, congratulate the winner. 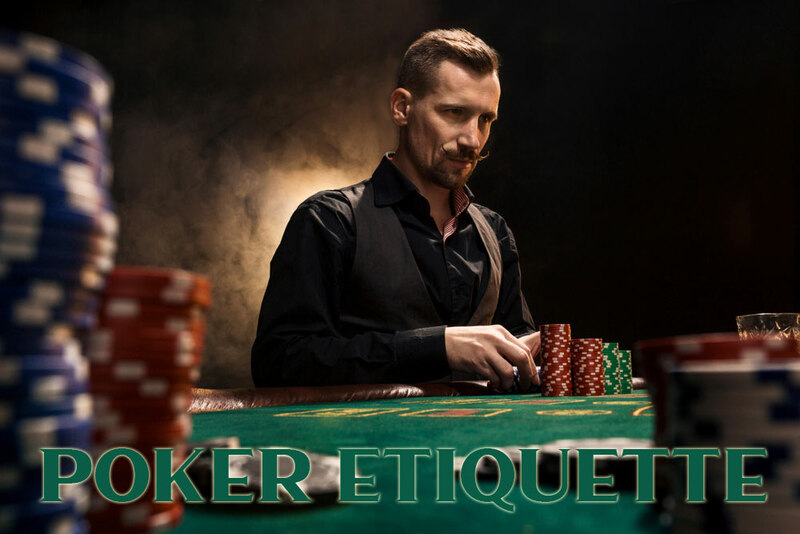 In short, use the same good table manners you were taught as a kid and you’ll be a welcome member to poker tables everywhere. When you win, be sure to say a proper goodbye, don’t grab your loot and head straight for the door. Good relationships can mean useful contacts down the road. « Hold onto your saddles because the ultimate H.O.R.S.E poker guide is here!